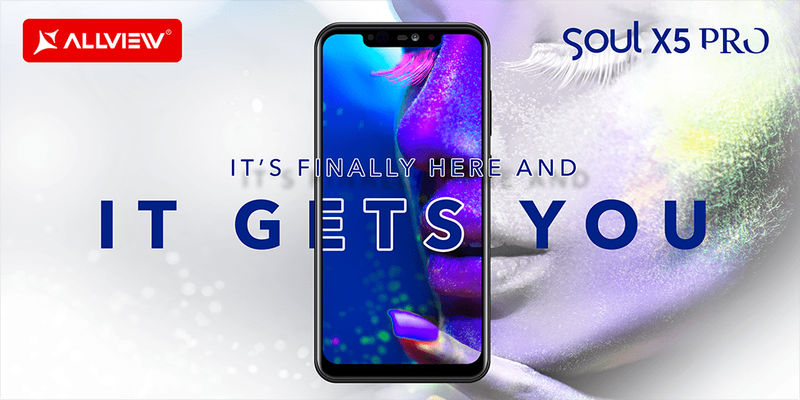 19.06.2018- Allview, the European smartphone and tablets brand, announces Soul X5 PRO, its new flagship - the company's first terminal that has neural technology and allows unlocking through facial recognition (Deep Face ID). „In order to create a useful product with high performance due to artificial intelligence capabilities, with the completion of the design and configuration of this model, we began integrating Android ™ 8.1, Oreo and the latest technologies in this device. The expected results have emerged immediately, giving birth to the Soul X5 Pro, the new Allview flagship. Due to the maturity of the smartphone market, since mid-2017 we have been focusing our efforts on mid-high-end phones and on the development of new devices, continuing to simplify the use of the AVI multilanguage voice assistant technology as well as other systems aim to create free time for an easier life”, stated Lucian Peticila, Allview fonder. Among the new flagship features are: the MediaTek Helio P60 processor with AI, the 6.2’’ FullHD + display, Deep Face ID, the dual camera with latest trends adapted features, the front camera with Bokeh effect, the multilanguage voice assistant and a new user interface, UI 3.0 swipe. The MediaTek Helio P60 scored over 140k points AnTuTu Benchmark. Compared to the previous generations of MediaTek, the Helio P60 processor is 70% more powerful, and an important leap in the new wave of innovative technologies, providing support for artificial intelligence, including facial recognition, object identification, and photographic scenes. The 6.2’’ FullHD + display with Notch incorporates new techniques and advanced materials backed by rigorous manufacturing processes, all of which ensure protection in unpleasant situations such as scratches, shocks and light falls. The IR camera of the new Soul X5 Pro is designed for facial recognition and, together with the IR projector and dedicated IR proximity sensor, reflects the user’s face contour in the camera. Using the processing algorithm and artificial intelligence, it outlines the detailed and accurate 3D map of the user's face. Therefore, it will be impossible to unlock the terminal through photos, masks, digital screens, or if the user’s eyes are closed. The 16MP + 5MP Dual Camera and the 16 MP secondary camera will give the user the experience closest to using a professional DSLR. Among the most important features are: Bokeh, Slow Motion, Selfie Group, Professional Mode and Scene Recognition. AVI, the multilanguage voice assistant, performs a lot of actions designed to make life as easy as possible for the user. With Visual UI 3.0 and swipe gestures, the user can access common features such as: home, back, history, main menu, notifications, including adding or disabling the notch. The device is equipped with a 3,000mAh battery that benefits from USB Type C charging and through wireless station.